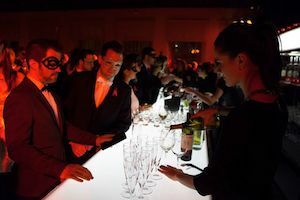 This Thursday, February 13th, Marché Bonsecours in Old Montreal will once again roll out the red carpet for the Farha Foundation’s eagerly awaited annual Maskarade fundraiser. For the last 22 years the Farha Foundation has raised money and worked closely with local organizations that focus their efforts on HIV/AIDS research and awareness. The Maskarade is the crown jewel of the foundation’s fundraising efforts. This year’s Maskarade theme is “Elixir” and it promises to draw Montreal’s most daring fashionistas, celebrated artists and the city’s social savvy to a night of fashion, fun and masked mystery, all for a great cause. There’s always a reason to get dressed up in Montreal. Doing so for a great cause is the icing on the cake. The Farha Foundation’s goal this year is to raise at least $300,000 for HIV/AIDS research and if the past is any indication, they will have no trouble reaching that goal. Last year I met with Linda Farha, sister to founder, Ron Farha and her determination, passion and love for her brother and the foundation was both touching and encouraging. Each year the Farha Foundation helps hundreds of thousands of people live better lives and she couldn’t be happier about that! For more information on the Farha Foundation and for further details on this spectacular event please visit their website.